What does Florida Bar Board Certification mean? Under Florida Bar rules, attorneys who are Board Certified in a specific field are allowed to identify themselves as Specialist or Experts in that specific field of law. 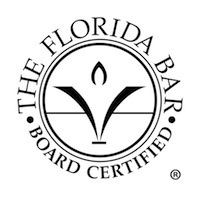 Board Certified Florida Bar members are the only attorneys in Florida who can identify themselves to the public as Board Certified, Specialist or Experts. By giving an attorney the recognition of Board Certification, the Florida Bar recognizes an attorney’s special knowledge, skills and proficiency in a specific area of law. The certification shows the attorney demonstrates professionalism and ethics in law practice. Since 1982, The Florida Supreme Court established board certification as a way for consumers to identify specialist in various areas of law. Board certified lawyers are legal experts dedicated to professional excellence. Only 378 lawyers in Florida are Board Certified in Criminal Trial law. Board Certification is the highest level of evaluation given by The Florida Bar for competency and experience. Criminal Trial Law is one of 24 areas of law approved for certification by the Supreme Court of Florida. Of all the 75,000 lawyers who are members of the Florida Bar members, only 378 of Florida lawyers are Board Certified in Criminal Trial law. Ken Swartz is one of those Florida lawyers who have earned the distinction of Board Certification. What must a Florida Bar lawyer do to achieve Board Certification in the field of Criminal Trial? Complete at least 45 hours of approved continuing legal education requirements in the area of criminal law. Ken Swartz is a Board Certified Criminal trial lawyer. Making a selection for a lawyer can be a difficult and often intimidating experience. The stress and pressures of a crisis which demands having a lawyer on your side can make the selection even more difficult. Many people rely on the recommendation of family and friends and that may be the best method of selection for some. But a person, who demands that his or her attorney have the skill, experience, and proficiency to be called an expert, will settled for nothing less than Florida Bar board certifications. When you face a criminal charge or investigation that could forever change your life, shouldn’t you have a Board Certified attorney in your corner? Ken Swartz has been recognized by the Florida Bar as a Board Certified Criminal Trial Lawyer since 1997. If you need the services of a Board Certified lawyer, we are here to help.